Enjoy Jersey hospitality and the very best produce the Island has to offer during the Jersey Food Festival; a week-long celebration of the Jersey Royal new potato, bountiful fresh seafood and award-winning dairy produce for which the Island is justifiably famous. The festival, which is now in its third year, runs from Saturday 18th to Sunday 26th May and will be launched in the Central and Fish Markets on the first Saturday (18th May) as market traders join together to celebrate the Island’s tradition of public markets. A farm and craft market will also be held on the same day in the Royal Square - Place du Marché – until two centuries ago, the town’s public market place. The event, organised by Jersey Tourism and supported by the Genuine Jersey Products Association, features some of the very best foodie people in the Island sharing their passions and showing the best ways to use local produce. Throughout the week, food lovers can enjoy farm and wine tours, low water walks and producer tours culminating in an al fresco food seafood paella event at the White House in St Ouen’s Bay – Le Don Hilton. Other highlights include fine dining in Michelin starred restaurants, foraging, food and ale trails, tutored tastings, brewery and dairy tours, chocolate making, foodie films in the cinema at the Grand Jersey, traditional afternoon tea as well as a ‘cider and sausage’ evening under the stars in the apple orchard at The Elms, headquarters of the National Trust for Jersey. 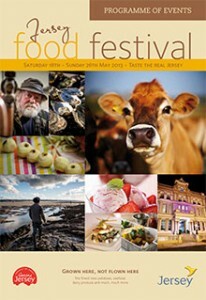 The festival programme is available from Jersey Tourism and participating organisations, and is available to view online or download as a pdf here: Food Festival Programme.